What Is Sunshine Arts & Crafts? 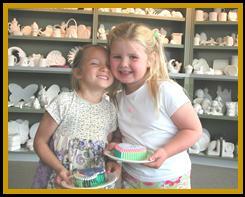 We are a painting and craft studio offering both Paint and Take as well as Fired Ceramic art for any age. You don’t have to be an artist to have fun. Our Studio offers a relaxed atmosphere and all the help you may want. Everyone can be an artist-just let your imagination go.